Volkswagen India has a brilliant fleet of cars, out of which, Cross Polo is a sporty looking hatchback. It is competing against the likes of Toyota Etios Cross, Fiat Avventura and others in this segment. It is being sold in one petrol and a diesel variants. This Volkswagen Cross Polo 1.5 TDI is fitted with a 1498cc. Its braking mechanism is further enhanced by ABS along with electronic brake force distribution, which prevents the vehicle from wheel locking in case of sudden braking. The car maker has given this hatchback an aerodynamic body structure, which makes is look captivating. Its frontage has a slanting bonnet with a few visible character lines, a trendy headlight cluster is incorporated with bright halogen lamps, a set of alloy wheels and many other such aspects. As far as its safety features are concerned, it is equipped with SRS airbags, advanced engine immobilizer, seat belt pretensioner, central locking system and so on. The company has given it a rigid body structure with crumple zones that reduces the impact of collision. At the same time, the company has done up its internal cabin with utmost care and fitted it with a driver oriented cockpit featuring an intuitive instrument and switch layout. It has been incorporated with well cushioned seats and integrated with adjustable head restraints, while driver and front co-passenger seat are electrically adjustable. Its dual tone dashboard completes the overall look and is equipped with AC vents, glove box and a three spoke steering wheel with multifunctional switches. For keeping the driver updated, it has an advanced supervision cluster, which helps in accessing the a range of user settings. The exteriors of this hatchback have been done up with flamboyance and has some very exciting features. To begin with the front fascia, it has a bold radiator grille with Cross badge and it has a thick horizontal slat that is finished in chrome. There is also a prominent company emblem, which is embedded in the center of this grille. It is surrounded by a bright head light cluster, which is powered with high intensity halogen lamps and side turn indicator. Just below this, it has a body bumper that has been trimly designed and houses a wide perforated black matte colored air dam that helps in cooling the engine faster. This air dam is flanked by a pair of bright round shaped fog lamps, which further enhances the visibility of the driver. The windscreen is made of heat insulating glass and has been equipped with a pair of intermittent wipers. Coming to the side profile, it has been done in a smooth and lustrous manner with black matte colored body cladding, which gives a completely different and sporty appearance. Its door handles are in body color, while outside rear view mirrors are in dual tone. These ORVMs are electrically adjustable and are integrated with side turn blinker. The pronounced wheel arches are fitted with a set of 15-inch light alloy wheels, which have a classy five spoke design. These rims are further covered with high performance tubeless radial tyres of size 185/60 R15. Its rear end has a curvy boot lid, which is embossed with variant badging. It also has a black bumper with a couple of reflectors, a radiant tail light cluster and a roof mounted antenna. This Volkswagen Cross Polo 1.5 TDI has a roomy internal cabin, which is incorporated with a lot of sophisticated features. To start with, the seating arrangement is quite comfortable and can take in five passengers easily. The seats are well cushioned and have been covered with top quality upholstery. Its rear seats can be folded to increase the boot space, which will help in bringing more luggage. The company has given this hatchback a lot of storage spaces, which adds to the advantage of its passengers. The list includes bottle and cup holders, map pockets in all doors, a large glove box, sun glass holder, rear parcel shelf and so on. Its steering wheel is quite responsive and makes it easy to handles even in peak traffic conditions. The dashboard is designed is made up from top quality materials and is incorporated with AC vents, a glove box, an instrument panel and steering wheel. The instrument cluster comes with radiant white back lighting illumination, which adds to the elegance of the interiors. All these aspects put together make the insides of this hatchback rather wonderful and makes it look stunning. This variant is blessed with a 1.5-litre diesel engine, which comes with a displacement capacity of 1498cc. It has the ability of churning out a maximum power of 73.9bhp at 4200rpm in combination with a peak torque output of 180Nm at just 2000rpm. This power plant is integrated with four cylinders and sixteen valves using double overhead camshaft based valve configuration. It is integrated with a common rail based direct injection fuel supply system, which allows the hatchback to deliver 15.7 Kmpl in the city traffic conditions. While on the bigger roads, its mileage goes up to 20.6 Kmpl under standard driving conditions. This diesel motor is cleverly mated with a five speed manual transmission gear box, which sends the engine power to its front wheels. It enables the vehicle to zoom towards a top speed in the range of 160 to 165 Kmph. At the same time, it can cross the speed barrier of 100 Kmph in close to 14.4 seconds. This hatchback has been bestowed with a proficient braking and superior handling mechanism that works exceptionally well in every conditions. Its front wheels are fitted with a set of ventilated disc brakes, while its rear wheels have been assembled with conventional drum brakes. This braking mechanism is further enhanced by ABS (Anti-lock braking system) that prevents locking of wheels and reduces the risks of skidding on slippery roads. On the other hand, its front axle is assembled with a McPherson strut along with stabilizer bar. Whereas, the rear axle has been bestowed with Semi Independent trailing arm type of suspension mechanism. The company has given it a speed sensitive steering wheel, which is quite responsive. It comes with tilt adjustment function that makes it easy to handle even in peak traffic conditions and it supports a minimum turning radius of 5.4 meters. 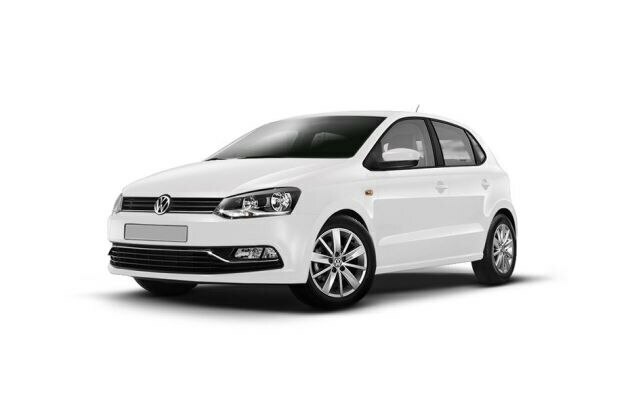 This Volkswagen Cross Polo 1.5 TDI trim is bestowed with a number of refined features that are sure to provide a comfortable driving experience to its passengers. It is bestowed with an advanced music system that supports Bluetooth connectivity for pairing the mobile phones. It is equipped with a few features like radio with AM/FM tuner, CD/MP3 player, USB interface, Aux-in port, iPod and four speakers, which enhances the ambiance of its cabin. It has an efficient fully automatic temperature control with rear AC vents that cools the entire cabin in no time. The advanced instrument panel houses a lot of warning and notifications for keeping the driver updated. The list of functions are a tachometer, seat belt and door ajar warning light, digital clock, electronic tripmeter, distance to empty and so on. Apart from these, it also has all four power windows with driver side auto down function, height adjustable driver seat, boot lamp, day and night inside rear view mirror, sun visors with vanity mirror on co-driver side, rear parking sensors and many more. The company has bestowed this hatchback with a lot of features, which gives the occupants a stress free driving experience. It has an advanced engine immobilizer with floating code for preventing the vehicle from any unauthorized entry. Apart from these, it is incorporated with front under-body guard, height adjustable headrests (front and rear), emergency exit, front and rear fog lights, ABS, dual frontal air bags, pinch guard safety for all 4 power windows, high mounted third brake light, interior rear view mirror and many more sophisticated functions. 1.Safety aspects are at par with other competitors. 2. Lack of leather upholstery.